Yesterday I posted a story about the case of the Leper in Lev. 13-14. Today I noticed something else that I think we can take joy in. The case of a woman with a blood flow problem was a terrible one, just like in the case of leprosy. It produced loneliness, shame, and despair. The woman in the Mark passage sought medical help, but the medical experts only made things worse. If we are to consider the case of the blood flow as a type of sin, like the case of the leper, then we learn that all human effort to cure sin will only make things worse. The woman exhausted all human solutions. She had only one place to turn now. She heard about Jesus, His character and power. 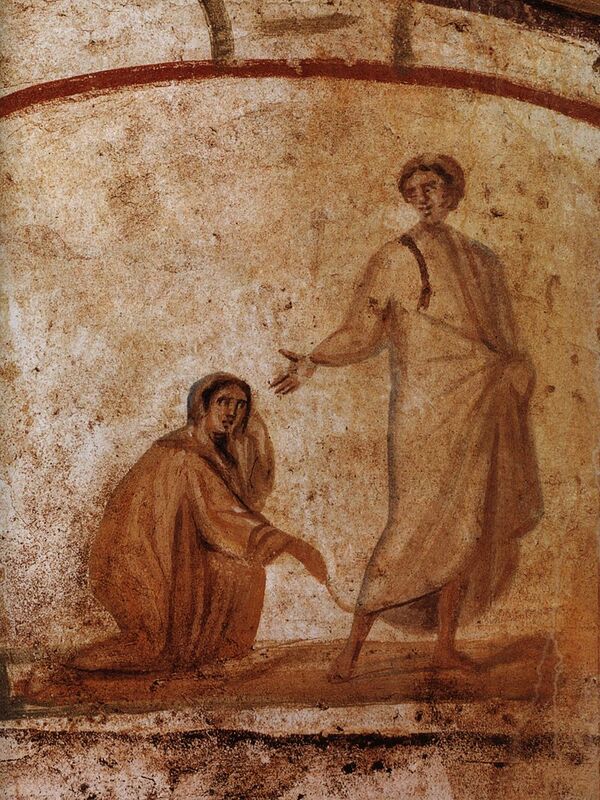 As a result, she realized if she merely touched the hem of Christ’s garment she would be made whole. According to Numbers 15:37-41, that garment represented the obedience of the Israelite to God. And as we know, our Lord obeyed to death, even the death of the cross. She touched that hem and was healed! The lesson? “For as by one man’s disobedience many were made sinners, so by the obedience of one shall many be made righteous” Romans 5:19. And as we know from the context, the many are the ALL of verse eighteen. Think about the relief this woman felt! Think about how joyous an occasion this was! “Immediate” cleansing for a lingering, incurable, and embarrassing disease! All hail the power of Jesus’ name! Every time our Lord performed a miracle He was demonstrating what His kingdom is like. This disease of flowing blood is a type of sin. We can’t cure ourselves of sin, but Jesus Christ can. In healing the woman’s disease, our Lord was proving that there is no sin he can’t forgive, no wrong which He can’t make right, no problem which He can’t solve, and that there’s nothing wrong with this world that He can’t fix. What a Savior we have! O Come Let Us Adore Him!